Takao Hyakutome was born in Sapporo, Japan. He started private violin lessons at the age of four with Hidetaka Murayama, later with Eiko Ichikawa and Sachika Mizuno. In 2001, he met the violinist Roby Lakatos who recommended him to Professor Dirk Verelst. In 2003, he was accept as violin student at the Royal Conservatories of Antwerp (Belgium) and Maastricht (the Netherlands). In Mallorca, during a tour in Spain in the summer of 2005 with "Maastricht Resonance", he performed "Monochrome Time I" for violin solo by Kayoko Morita, a premier world performance broadcasted on national television. 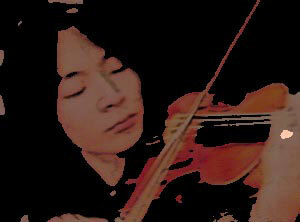 From 2003 till 2005, Takao Hyakutome was a member of the Roby Lakatos Orchestra. In 2004, he performed at the Canetti International Violin Competition where he received the Special Prize. As a soloist he has performed Maurice Ravel's "Tzigane" on the Gala Concert 2005 at the Singel in Antwerp with the Royal Conservatory Symphonical Orchestra. Takao plays an Italian violin made by Edoardo Marchetti in Torino 1910.